My diary records that I went on three club runs, the two longest (both 75 miles) to Wheathampsted and Tewin on the 15th and, on a very cold day (29th), to Guildford. On the 25th I received a letter from Thanet’s giving me a quotation for the ‘Silverlight’ frame that I had ordered some months earlier. The quotation was for £17/7/6 [£17.37 in today’s money! ], somewhat more than expected. It was to be several more months before I had saved up enough from my paper-round. The frame finally arrived on August 17th (see later). The first Sunday of the month was wet and windy, but we still went on the club run, 82 miles into Essex for the first time. [Nothing seemed to stop us in those days!]. The agony of wind and rain was compounded by my chain breaking, but my diary shows that it was mended at the roadside by one of our veterans, Stan Boyes! On the last week-end we left on the Saturday afternoon for a week-end to Milford Youth Hostel; back on Sunday night after covering 101 miles. Sunday March 5th was the annual ‘hard-riders’ run to Winslow. This event was held every year and had started, innocently enough, on a club run a year or two before when the club’s normally sedate pace developed into a ‘bash’! The ‘Winslow bash’ then became an annual event, starting just beyond Watford, going out through Tring and Aylesbury to its finish at the 30 mph sign at the outskirts of Winslow. The 1950 ‘event’ was apparently unseasonably warm and I wore my shorts for the first time. Nevertheless I was soon dropped by the fast-moving bunch, and had to take pace from a couple of ‘league-bods’ [members of the British League of Racing Cyclists, BLRC: more later]. The 76 mile club run on Sunday 19th was again through Epping Forest to Harlow [What was the fascination with Essex, I wonder?]. My diary records it as a super day, although with a strong head wind on the way home. April saw the beginning of the school Easter holiday, hence the greatly increased mileage. I got out on four club runs, the longest being 102 miles. Highlights of the month were over the Easter weekend. On Good Friday (April 7th) Brian’s father took us to Herne Hill to see the annual cycling meeting. In the 1950s these Easter meetings were packed with cyclists most of whom seemed to arrive across London by bicycle and to leave them chained together in enormous heaps. Most Good Friday meetings are blighted by cold and rain, but I remember the 1950 version being held on a day which was unseasonably warm. It gave us the chance to see the great Reg Harris [my boyhood hero: see below]. Unfortunately, Good Friday 1950 saw Reg beaten by his arch-rival, the hugely talented and bespectacled Dutchman, Arie van Vliet. On Easter Sunday we rode almost as far as Horsham, making a detour on the way home to record our first ‘century’ ride of the year. A second long ride was taken on Sunday 16th (102 miles) and on the 23rd we marshalled for the club ‘25’ in which our champion, Colin Turner, did a 1.05.31. Although the month of April started hot, it ended with heavy snow on the 24th and 25th. I did my first junior ‘10’ mile time trial of 1950 on May 3rd and did ‘evens’ [more than 20 m.p.h.] for the first time, recording a time of 29.34. In June I went on four club runs, including one on a very hot day to Taplow, Aldermaston and Staines (101 miles, with detours to make up the century!). The longest run was on the 18th to Littlehampton with stops at Chiddingfold for ‘elevenses’ and Godalming for tea; I recorded the 145 miles as a record mileage to date. The junior ‘10’ mile time trial on Wednesday 14th was held in pouring rain but I improved my time to 29.14 and took first handicap award [I still treasure the medal that I received]. This was a quiet month for cycling, mainly because I was away on a school trip to Pembrokeshire (12th – 19th) and a family holiday in Dorset (23rd – 29th), both without a bicycle. However, on the 5th I recorded 28.37 in the club ‘10’ [I seemed to record a steady, if unspectacular, improvement in my times! ], and went on several short runs to Camberley (61 miles), Wheathampsted and Stevenage (79 miles) and with Brian through the Chilterns on the 31st (58 miles). At Stevenage on the 30th I complained bitterly about the cost of dinner : 4/- [20 p!]. The school summer holidays: so an improved monthly mileage. We went on four club runs, to Ivinghoe Beacon on the 6th (71 miles), Buckingham on the 13th (104 miles), Waddesdon on the 20th (85 miles) and to Harlow on the 27th (80 miles). The highlight of the month was undoubtedly the arrival of my Thanet Silverlight frame on August 17th after many months of anticipation. My diary tells me that I built up the bike and had it out on the road the very same day. Consistency in the club ‘10s’ continued with two rides, 28.11 on the 9th, and rather disappointingly, 28.21 on the Thanet on the 23rd. I had hoped that my new frame would make me super-fast! The Thanet ‘Silverlight’ Frame. The Silverlight was one of the most distinctive bicycle frames produced during the early post-war years. It was constructed so that the down tube and the seat tube, both of a narrow 1 inch diameter, joined below the bottom bracket in a “V”, and the seat stays joined the top tube about 5 to 6 inches in front of the seat cluster. The bottom bracket was thus ‘cradled’ within the frame, a design that was claimed to reduce frame ‘whip’. The frame was also extraordinarily light: about 3 lb 12 oz for the frame without forks, and a further 1½ lb or so for the forks. This compares very favourably with modern alloy frames. It was certainly a comfortable and responsive bike to ride. Very few Silverlights were made, probably a total of less than 500 between the late 1940s and 1958 when production ceased. This makes them a very rare item today. I rode my Silverlight until about 1953 when I sold it to a club-mate. I regretted this sale for decades thereafter, but have recently (February 2000) managed to locate a replacement 50 years after the first purchase – at a price more that 40 times the original! I have few pictures of my first Thanet Silverlight. The one shown here at least shows the structure of the bottom bracket! 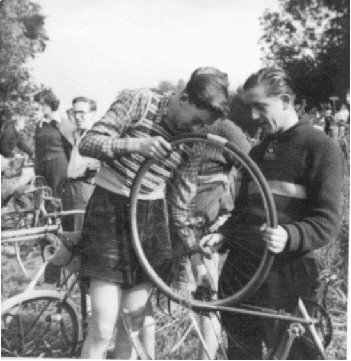 Club-mate Bob Harvey is helping me with my puncture; Brian Major is in the middle distance on the left. The month started with a run with Brian and Jeremy Sexton to Nettlebed, High Wycombe and Taplow (101 miles), followed by an early start (4:35 a.m.) on Sunday 3rd to ride out to Longwick to marshal in the club ‘50’ mile time trial (81 miles). On the 10th of September we undertook the longest ride of the year: 150 miles to Littlehampton with ‘elevenses’ at Leatherhead and tea at Newdigate. We apparently came the ‘long way home’ from Newdigate to push the mileage up to 150! The following weekend was a two-day trip to Hastings and St. Leonards; 87 miles out on the Saturday and 93 back on the Sunday via Uckfield and East Grinstead. My diary records that we had fish and chips for supper on the Saturday night, with beer [serious evidence of under-age drinking here!]. The final week-end of this high mileage month was a very wet run to Camberley. Time trialling in the 1950s. 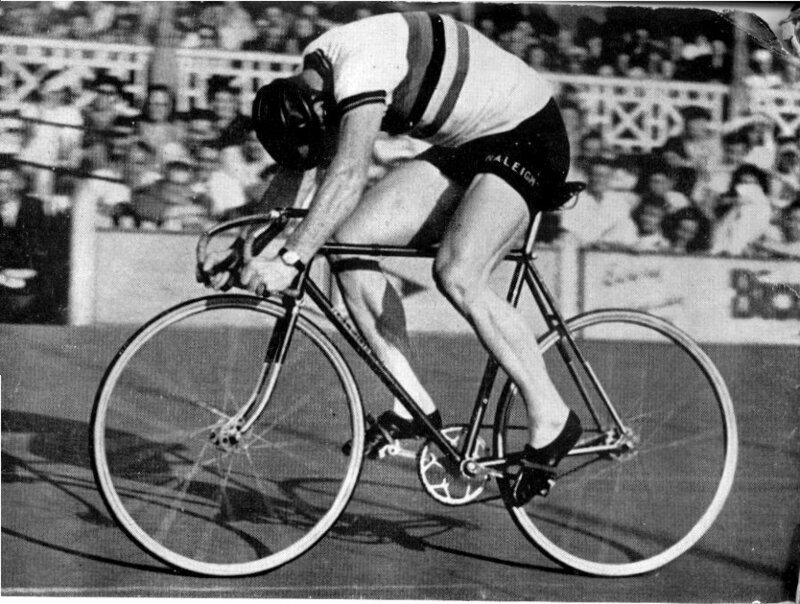 In the early 1950s most competitive cycling was in the form of time trials in which riders were (and are) sent off at 1 minute intervals to cover a fixed distance, over an out-and-home course in the shortest possible time, or to cover the greatest possible distance in the time allotted. Standard distances are 10, 25, 30, 50 and 100 miles, or 12 or 24 hours. Time trialling is regulated by the Road Time Trials Council (RTTC). In the 1930s and the immediate post-war years, this type of racing on the open roads was conducted, apparently, in great secrecy. Events started at very early hours on a Sunday morning on courses identified only by codes. Riders were required to be inconspicuous, wearing long black tights, black alpaca jackets and even black socks. 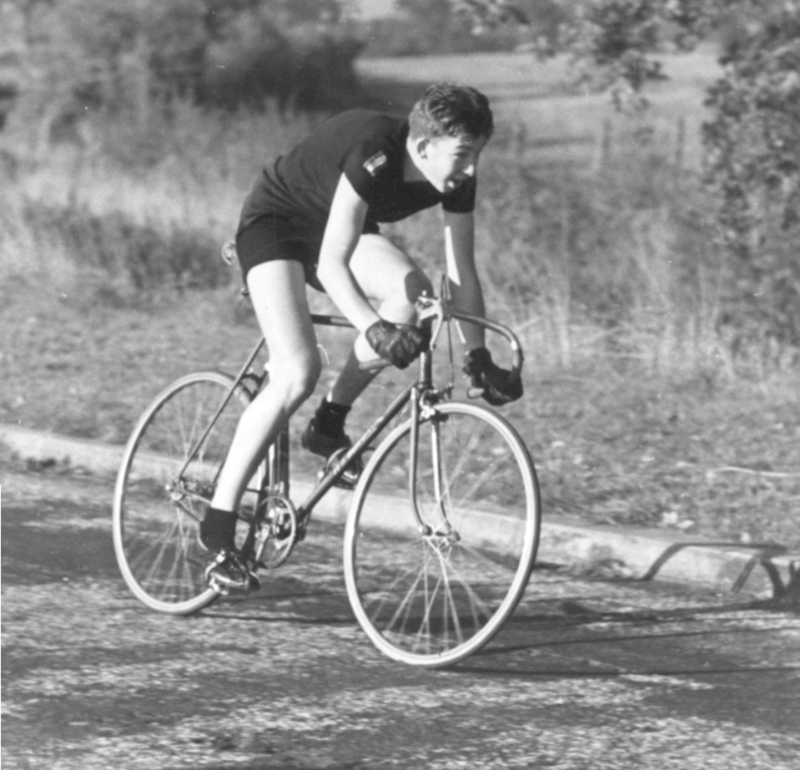 In the early 1950s riders were allowed to wear ‘track’ shorts and short-sleeved jerseys, but still all in black. By 1952 (see photograph) we were allowed to wear a coloured ‘flash’ on the shoulders to identify our club, but any other colouring, or lettering, was banned. Only in 1953 and later were we able to wear racing jerseys in club colours. I went on six long rides in October, the most notable being a hard 120 miles to Cambridge on the 22nd with a stop on the way at Hatfield and tea at Ware. Earlier in the month (Sunday 8th) we made one of our many visits to the Ball Tower on top of the church at West Wycombe, where the “Hell-fire Club” used to meet in the 18th century. On one of these later visits we gained access to the caves under the hill and almost became trapped [see later]. On the 29th and 30th, Brian Huggins and I rode down through Godalming and Hindhead to stay with an aunt at Selsey, and back via Petworth and Godalming, to give a week-end mileage of 159. The month started with a week-end away to the youth hostel at Cleeve Hill, near Cheltenham, an annual ‘classic’ event with the Northwood Wheelers. Often the weather for this ride was absolutely foul, but in 1950 it was fine but cold. The outward run was via Stokenchurch, Eynsham and Northleach (91 miles); the return trip through Cirencester, Wantage and Faringdon to Reading (100 miles). The week-end was relatively uneventful – not like that of the following year! On the 12th the club went on a run to Bishops Stortford with a stop for tea at Cowper’s Cottage in Harpenden. I remember teas at Cowper’s Cottage as being truly memorable, even titanic, with up to 20 riders tucking into enormous plates of bread, jam and cakes. This was followed on the 26th with probably the coldest and most miserable ride of my life – to Leighton Buzzard with Brian. There was a sharp frost with freezing fog and a thick hoar on the hedgerows. My hands literally froze and were very painful with the subsequent thaw. In desperation we opted for a ‘posh’ dinner stop at Leighton Buzzard (the Unicorn Hotel) but my diary complains that the price for the dinner, although very good, was 4/10 [about 23p!]. One consequence of this very cold ride was that I purchased a pair of stout leather mittens from W.F. Holdsworth’s which lasted me for years [more about these rather famous gloves later!]. Wednesday 29th records me seeing the great Reg Harris on television [it must have been at a neighbour’s became we did not get TV until about 1954]. Reg attempted to ride at 100 mph on the rollers, but on this occasion he failed, only achieving 98.75 mph ! Made only three runs this month, the longest (85 miles) through snow showers on the 3rd. In the middle of the month winter set in with heavy snow on the 13th to 17th which froze solid, making cycling almost impossible. It then thawed but the roads remained virtually unrideable until the 21st. However, looking forward to 1951, Brian and I bought a series of maps and planned our tour to Scotland for the following summer [more later]. The year ended with me making a resolution to do more cycling – a resolution, I am happy to say, that I was able to keep.